BALTIMORE (AP) The season hasn't started yet, and the Baltimore Orioles are already in next-man-up mode. Right-hander Andrew Cashner will replace injured Alex Cobb as Baltimore's starter Thursday on opening day at Yankee Stadium. Though he wasn't the first choice of rookie manager Brandon Hyde, the 32-year-old Cashner was happy to step into the role. "This will be my second one. 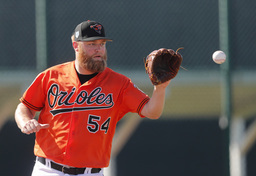 I'm excited for it," Cashner said Tuesday after a team workout at Camden Yards. "I have some family in town, and I get to kick off baseball." Cashner's previous opening day start came in 2014, when he stymied the Los Angeles Dodgers over six innings for San Diego. "That was before the home crowd," he said. "It's a little bit different, but you take it in stride. There's only one opening day." "We kind of came to an agreement that it was the right thing to do," Hyde said. "It's early. We want 30-plus starts from him. We want Alex for the majority of the season, and not lose him because we pushed him early and made a start he wasn't ready to make." "He's excited to do it but felt bad for Alex. They're close friends," Hyde said. "I know everyone was looking forward to Alex making the opening day start. It's just an unfortunate circumstance. But we have all the confidence in Cash to go out and give us a good start on opening day." Hyde said Nate Karns will start the second game of the series Saturday as the "opener" for a series of relievers. "We're trying this out. It's new for us, new for me," Hyde said. "Our bullpen will be rested." "There's a different vibe in the room this year, for sure," Cashner said. "I think it's going to be more relaxed kind of atmosphere." "It was a good camp, the energy level and the hustle," Elias said. "We've got young players here, a lot of guys that are looking for opportunities in their careers, and then some veterans here to guide them. We'll see where it takes us."